The online shop is like an angelic beauty with a glowing halo attracting aspiring entrepreneurs to a land of gold. An online shop is easy to setup and cheap to run. It will be your very own e-commerce store. And you can operate it from home, in your own time, quickly and easily. The online shop represents freedom. 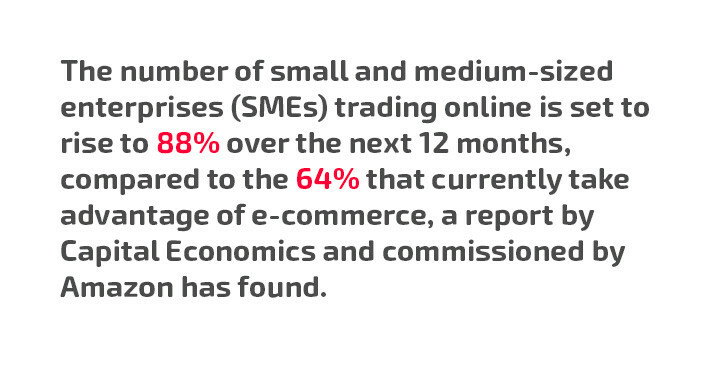 The number of small and medium-sized enterprises (SMEs) trading online is set to rise to 88% over the next 12 months, compared to the 64% that currently take advantage of e-commerce, a report by Capital Economics and commissioned by Amazon has found. In reality though, that angelic beauty is a devil in disguise who’s literally planning on your demise. 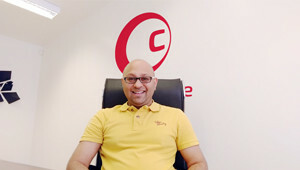 You see, I run a branding and web design studio in Romford, Essex and I’ve built dozens of online shops for clients. And from that experience I can safely say that online shops are no way near as easy to setup and run as people think. Now this article is not to discourage anyone from taking the plunge into self-employment and opening an online shop. This article highlights 14 common mistakes that individuals make when they open their own online shop. And if you know the pitfalls, you can avoid them. 14 start-up mistakes that online shops make. If you’re looking to open a shop, you have two options. You’re probably thinking about all the hassle, overheads, deposits and risks that come with opening a high street shop. And then you’ll think how you don’t need any of that for an online shop. Most people will opt to open an online shop because they see it as a cheaper alternative to opening a high street shop. However, in terms of work, an online shop is no different than a bricks and mortar shop. It needs just as much, time, effort and investment to make it a success. The only real difference is that with a real shop, everything is physical. You’ll have physical problems that you can see and solve such as fittings, signage, cash registers and electricity bills. With an online shop you’ll have just as many problems except they’ll all be technical and beyond your visual eye. The truth is that an online shop costs just as much to run (if not more) then a real shop. For every overhead you have as a physical high street shop, there’ll be a similar overhead to pay as an online shop. At best you’ll be looking at an average of £2600.00 to start-up your online shop which could be considered as a low budget. And that doesn’t include stock or any costs specific to your business. So, don’t make the mistake of thinking that an online shop is cheap to run. It can cost as much, if not more than opening a High Street Shop. What about all these online and television adverts by big internet companies that say you can open an online shop quickly, easily and cheaply? Well, the truth is that you can open an online shop quickly, easily and cheaply. But making a single sale can be extremely costly depending on what you’re selling and how you’re marketing your shop. And keeping it up and running will cost even more. When opening an online shop, don’t just look at the immediate startup costs to get your shop open. Look at what the ongoing fee’s will be to keep your shop running. You have cash on the hip and a passion. Either a passion for business or a passion for your products. In any case, that passion drove you to take a risk, invest in stock and build an online shop. But what you may not have done is researched your online competition. And that’s a common mistake. Most online shops start with a misconception. They think that if they open an online shop, people will visit it instead of the competition’s shops. With an online shop, no one knows you exist. And truth be told, no one cares because they’re all busy buying from the competition. And there will be a lot of competition regardless of what you’re selling. Let’s say for example that you’re planning on selling clothes as an online fashion retailer. As a new online shop, you may think that you’re competing with the likes of Asos. But without a multimillion pound budget you won’t be. You won’t even be competing with the smaller brands that concentrate on a niche segment of fashion. As a new online shop, you’ll be competing with boutique brands and smaller start-up online retailers who already have a foothold in the marketplace. And competing with them will be tough. 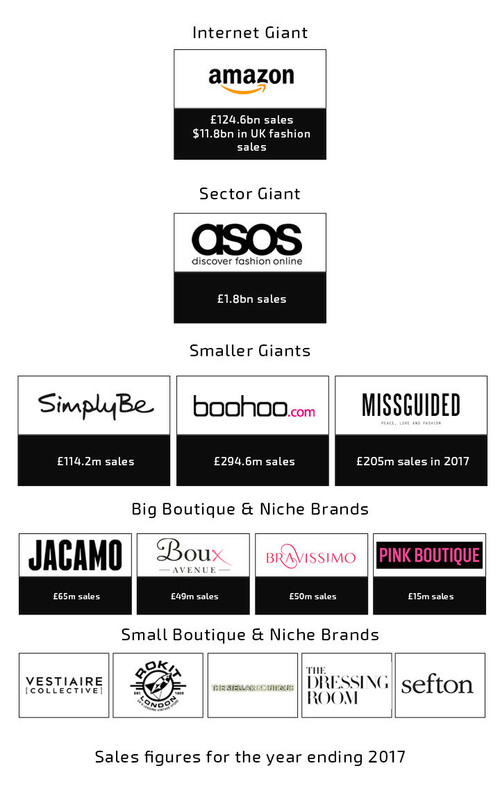 The above graphic doesn’t mention luxury brands like Net-a-Porter and neither does it highlight high street retailers such as Next and Zara. It doesn’t include high end fashion brands like Gucci or other internet giants like Tescos or Zalando who also sell clothes. It also doesn’t include the other thousand online fashion boutiques who have strong cult following, or independent retailers who operate on Ebay. Now, you may not be selling clothes online but the point is that this same hierarchy can be applied to any sector of e-commerce. Whether your selling fashion or food, balloons or bricks. Or even something completely original. There will be a hierarchy of competition against you. And that’s not a reason to not open an online shop or give up. That’s a reason to check out the competition and find your route to market. And to do that, you’ll need to look into branding. So, you’re a new online shop. And you invested in some branding. But did you invest in branding and an identity design or just a logo design? A logo is a great tool to market your online store with, but it’s not enough. Your branding needs a true purpose to establish itself and succeed in a competitive marketplace. To create fully effective branding, you need to start from the heart of the business. Then you need to transform this into a logo and visual identity design. The identity design should be a display of creative communication and a harmonious theme that markets your message to your customers. And an identity will become just that. A way for people to unambiguously recognise your online shop or any marketing material associated with it, at first glance. The end result should be an original system of design communication that separates your business from other similar online shops. Producing your brand properly gives your online shop the best chance of success by creating its own space in the marketplace. It gives your business a reason for existing, a reason for your customers to care about your online shop, and a way to market your shop with a competitive advantage. To create the brand for your online shop, carry out market research and figure out where you might sit in the marketplace and what type of customers you need to attract. Then move onto logo design. 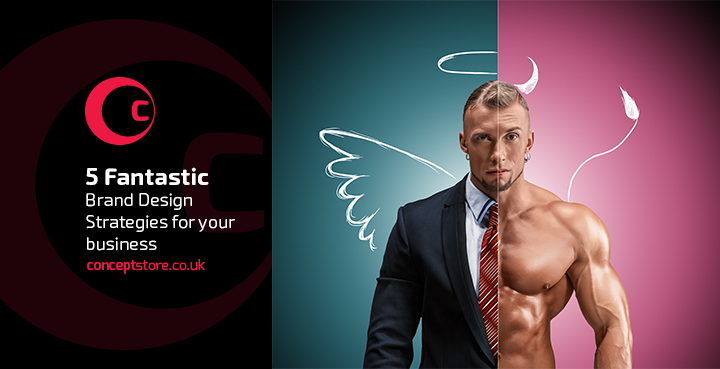 Your logo design could potentially be reproduced onto packaging, signage, paper and products. It needs to display well and it needs to communicate well. 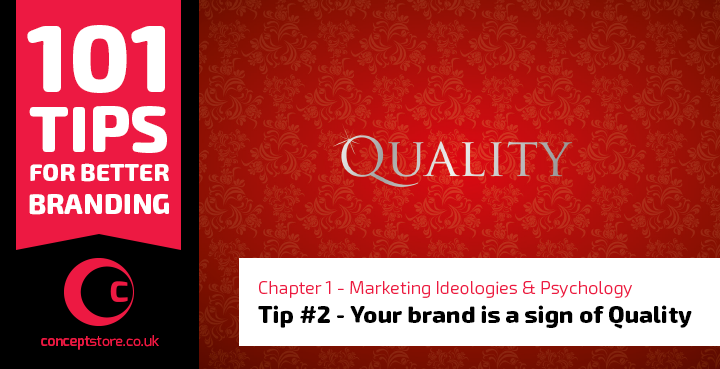 So don’t make the mistake of opting for cheap or amateur branding. Good branding and web design is important for an online retailer because people trust good design as oppose to bad design. If your business plan is to be the cheapest online retailer of something, then you can start-up without investing in branding or design because people will only be buying from you because you’re the cheapest. If a new competitor comes in and is cheaper then you, then there’ll be no reason for customers to continue to buy from you because they never cared about your business, only your prices. 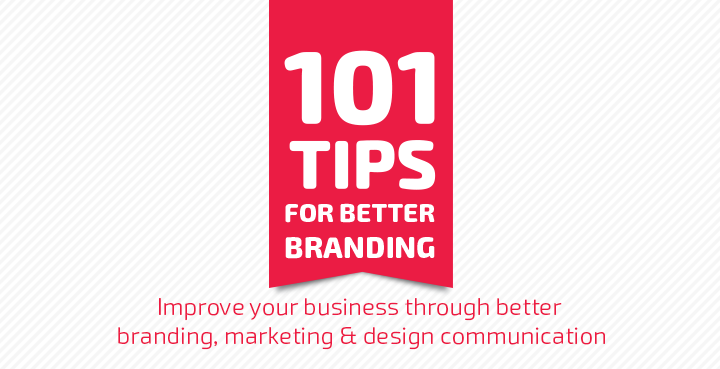 If your business has a USP, then branding and design communication is a must. If you don’t invest in branding as an online shop, you’ll always be competing on price. Learn how to create the perfect logo design and how to build a brand that people care about for your online shop. You may be ready to open an online shop but you may not be ready to give up your day job. And if you do decide to juggle an online shop with other employment then you’re going to need support, preferably technical support because your shop will be a full-time problem. Forget about problems with orders or customers. Your main problems will be upgrading the shop, fixing technical problems, setting up shipping, tax, products and a payment gateway within your store. It’s all made to look easy but in reality, it all needs a technical hand to work properly. Even quick start shops such as Shopify are not as easy to run as you may think. Creating graphics that work is one problem. Setting up the shop the way you want, is another. And making sure things actually work right will be the biggest problem. Your shop needs to be maintained and it’s a full time job so don’t make the mistake of leaving out technical support when you open your own online shop. You’ll be surprised at how much you need to learn and how much your web designer already knows about the way online shops work. Hire technical support and lean on them as much as you can to get the shop online, open and to keep it running. Without it, you may struggle to get your online shop open. 5. 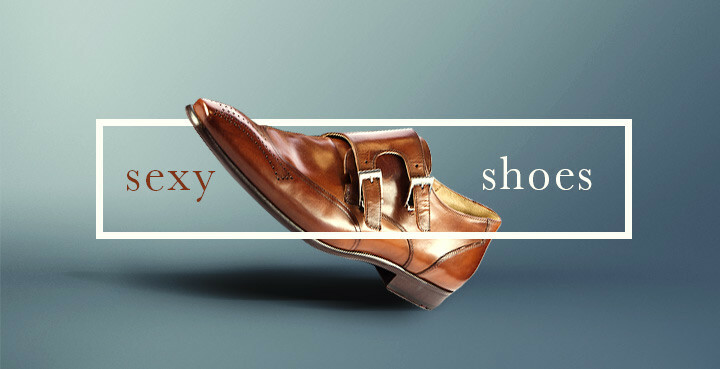 Not hiring a good web designer for your online shop. This meant that their online business plans went stale. And they were ready to trade. But they also had half of a bad website built on an outdated e-commerce system, so no business was being done. This was the result of hiring a bad web designer. These clients came to me for help and I helped. I looked into their situation to see what could be done to move their business plans forward in the quickest and most cost-effective way. In most cases I re-done their branding, built them a new website on a better platform and got their online shop open and running to start making sales. I continue to support these clients on an ongoing basis. Now, looking for a good web designer can be a difficult task. It really boils down to who do you trust? And who will do what they say? Don’t make the mistake of hiring a bad web designer. Familiarise yourself with e-commerce Content Management Systems (CMS) and be sure that your designer has a good reputation. If you’re really, truely serious about opening an online shop to sell products then you really, truely and seriously need some good product photos. You could do it yourself though. You’d need a good camera (preferably DLSR). And a staging setup like a lightbox. That’s how you get professional product photos (in a nutshell). That alone though could set you back anywhere between £200 – £3000. And that doesn’t include the help or training you may need to use the equipment. An alternative would be to find a cheap professional photographer. More often than not though, a cheap photographer is usually cheap because their inexperienced or don’t specialise in product photography. And the end results can be pretty poor. So overall, you could take a punt on doing it yourself or hiring a cheap photographer who, if you’re lucky, has a good portfolio of product photography, but the best option would be to hire a photographer who specialises in product photography. 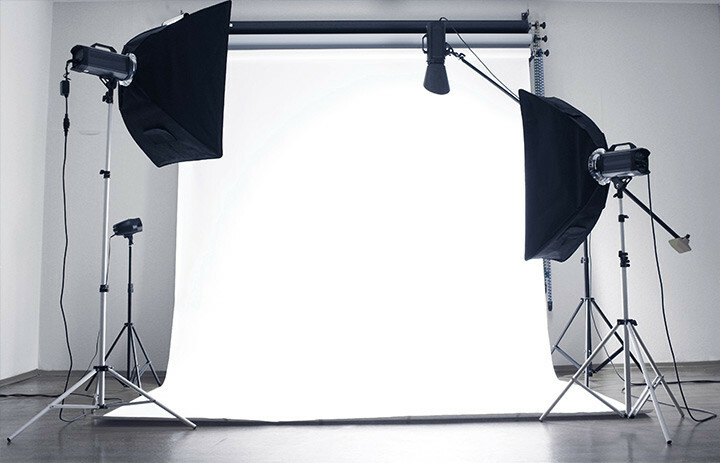 Is there really a need to hire a good photographer? Poor quality photos lead to an image of carelessness and distrust. They miss sales opportunities by not displaying the product in all its glory. And they diminish the overall look of an online shop. A bad photo gives a great reason not to buy any given product from any given retailer. Even if an online shop has 100 great photos and products. The one product that has a bad photo will likely be the one product that’s not selling well. Don’t make the mistake of using poor quality photos for your online shop. On the other hand, a good photo works wonders! It communicates good design, desire, care and informs customers with reliability. A good photo is a selling tool all in itself. You may find a photographer and get your product photos made but unfortunately there lies another mistake. Don’t just get single product shots made. Invest in some creative product photos as well. You see, a product photo on a white backing is great for a product page but there’s only so many times you’ll be able to use that same image for different marketing documents before it becomes monotonous. Product photos for marketing need some creativity and context to highlight the products beauty, purpose, character and a cause to buy. 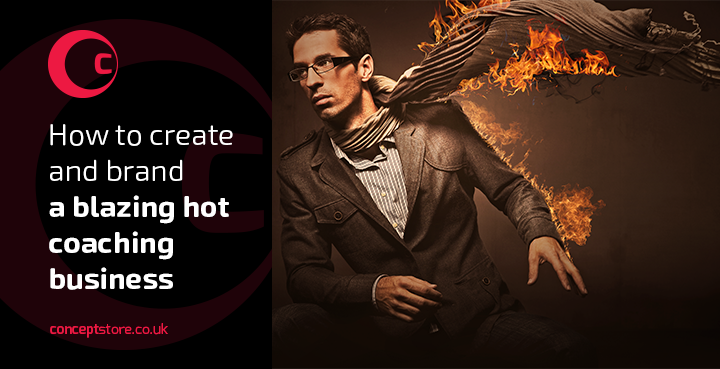 Creative marketing photos allow your products to become expendable by reinventing the same product as something new. They’re also good for re-marketing to specific segments of your target audience. If your budget doesn’t allow for creative photography then make sure you get some good product shots at different angles so your graphic designer can artwork your photos into something new altogether. I’ve built websites, directories and online shops for a lot of clients who opted not to take ongoing technical or creative support from me. The family friend they took on, knew how to use a computer but didn’t know anything about web design or graphic design. They didn’t know how to manage the shop side of the website. And they didn’t know how to promote the online shop. In the end, these online businesses dried out because the website had no visits and no sales. 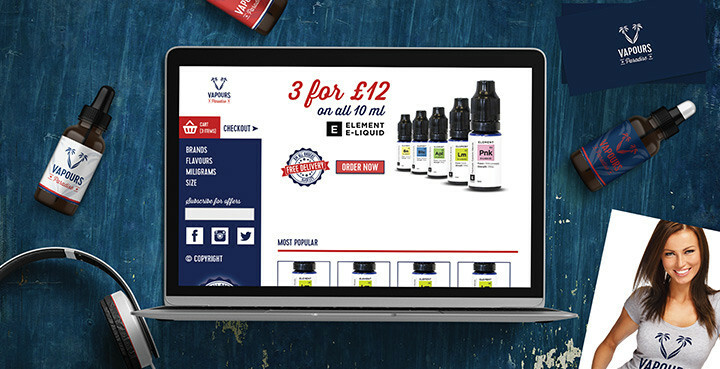 The website owners built an online shop but didn’t know how to manage it, how to market it and how to retain customers. And they didn’t understand the value that creative support and graphic design delivers for an online shop. You see, when a new user visits your online shop, they’ll see a variety of homepage graphics, banners and sections. 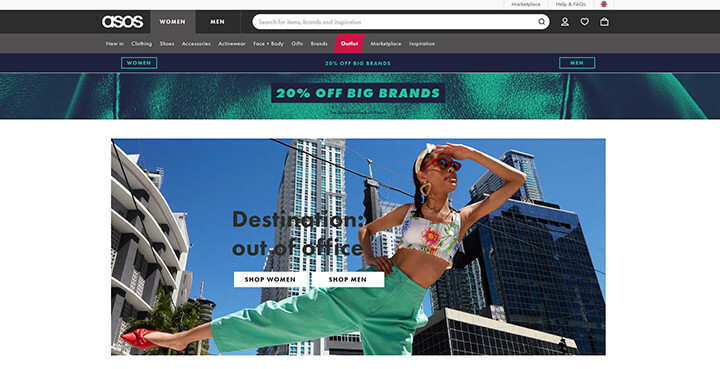 Asos website featuring sections, graphics and text to influence users. These sections market your products, influence the customer and give them a reason to buy, using graphic design and text. 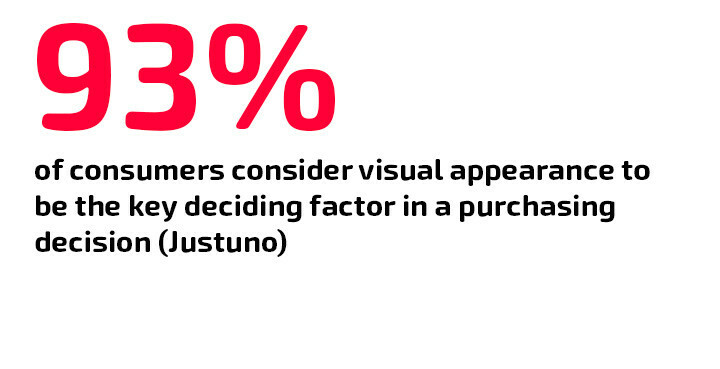 Your users will browse your shop and make a purchase based primarily on the graphics that they’ve seen. Then they’ll leave your online store. What you’ll need to do is entice them back so you can sustain business and hopefully build a brand. And to get them back in store you need to show them another set of influential graphics. 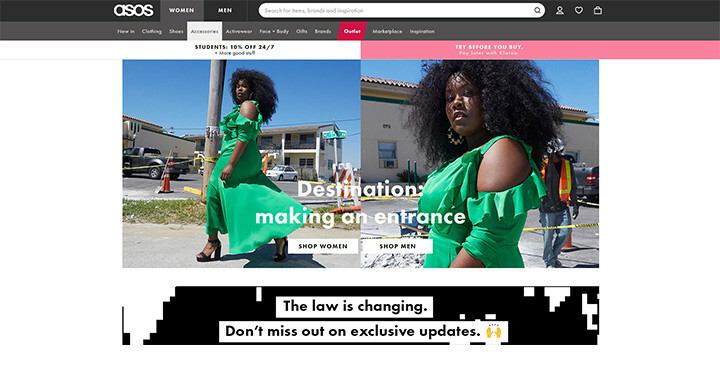 Asos homepage in the second week of May. New graphics represent both an invitation for the customer to return to your online store and psychologically, something new for them to buy into when they return. Whilst most start-up online shops invest in web design, they don’t invest in graphical design support. Creative support is dire in building and running an online shop. Without it, you may find that your website is just a sitting duck with no sales and no visitors because you have no way to retain customers. You can try creating graphics yourself but be warned that if you don’t know what you’re doing, you could do more harm than good for your online shop. This is so the graphics load fast and display well. If you don’t do it, your users could be waiting tens of seconds, even minutes for an image to load on your site. A user is not likely to wait more than 8 seconds for your page to load before closing the site and moving on. Graphic design or digital design is an ongoing job from day one for an online shop, yet it’s an overlooked area by most. If you’re starting an online shop, give it a month without creative support and you’ll soon realise for yourself that you need new graphics to bring in sales. You’re either a business person who’s run a business before and knows a bit about marketing offline, and now you want to dive into the digital world of e-commerce. In any case, you’ve had some experience with marketing and digital platforms. But do you really know anything about online marketing for an online shop? There’s nothing wrong with not knowing what the above abbreviations mean. But there will be something wrong with your online shop if you don’t learn about these terms as an online shop owner. Because your online shop, will be online! Your target audience is online! And the place where they’ll start to look for products like yours, is online! Doing traditional offline marketing is a good thing and it needs to be done. Flyers, brochures, networking, adverts, events etc are all beneficial marketing tactics for an online shop. And being internet or social media savvy is also a great advantage. But as an online shop owner you’ll need to go deeper into the digital world of e-commerce to really make any headway with your online shop. As a new online shop owner, it’ll be your way to generating sales and future proofing your online shop. Don’t make the mistake of ignoring online marketing or thinking that its cheap, free or even easy. Get to grips with online marketing as an online business and make it a priorty in your marketing plan. SEO may be a familiar topic for you but every new shop owner I’ve worked with had no idea what SEO is or how search engines work. The truth is that the art of SEO is a minefield! If you don’t know what it is. In laymens terms, it’s the practice of getting your website ranked within a search engine. Any given search engine will send things called “spiders” to go through your online store and analyse everything from page speed and programming to the text and images used on your website pages. They’ll gather tons of information such as what content is on your page, what words are being used, how old your domain name is, how many links you have, how many users are looking for your website, why and for how long, and then they gather all of this information plus more to determine your reputation as a website in regards to what a user has searched for. Then they’ll rank your website/webpage in their search engine accordingly when a user types a query into the search engine. And when a user types a query into a search engine, they’ll use specific keywords to find what they’re looking for. And that there is the key! You need to do SEO Keyword research to find out what keywords and phrases customers may be using to find online shops or products like yours. Then you need to optimise your website so it has a reputation with that particular keyword. To explain better, let’s use an example. Let’s say that you’re in the market for a new T-shirt. When I type T Shirt into Google, these are the results. 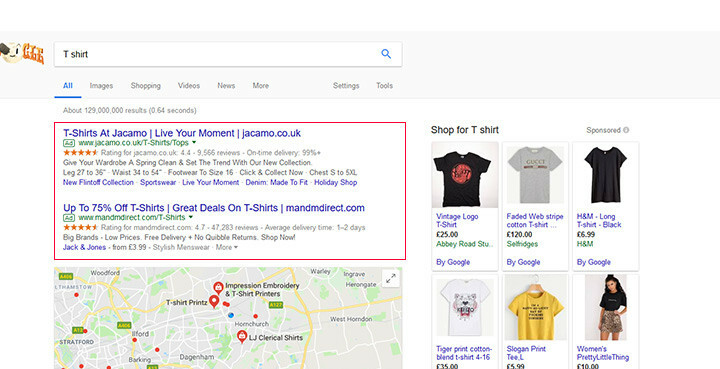 First, we have some Pay Per Click adverts (Red Box), followed by a list of local T-Shirt printers (Green Box) and then the ranking results for T Shirt retailers (Blue Box). 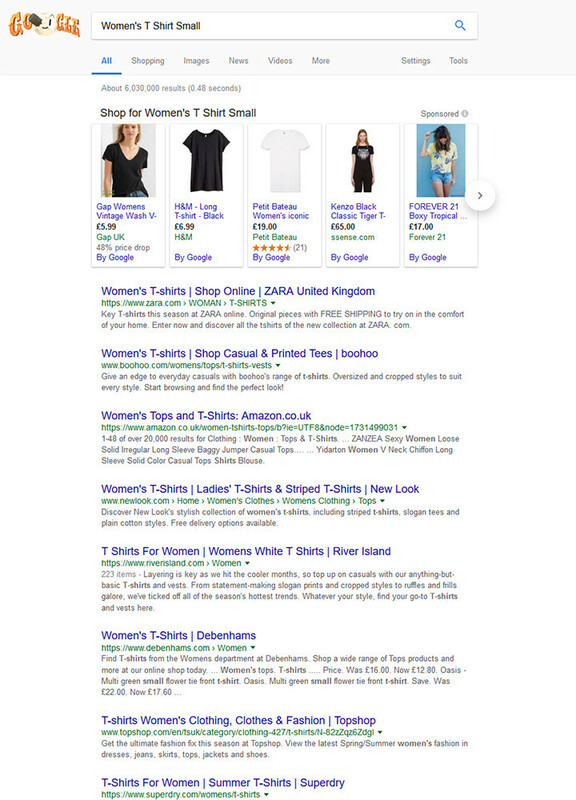 All of the ranked listings (Blue Box) relate to big name brands who have optimised these listed pages for the keyword “T Shirt”. These big-name brands will dominate search engines for generic keywords such as “T Shirt”. And the chances of you competing with them for the term “T Shirt” is pretty slim. Big retailers have hundreds of pages, links and products that relate to “T Shirts”. And these correlate to a strong online reputation for “T Shirts”. 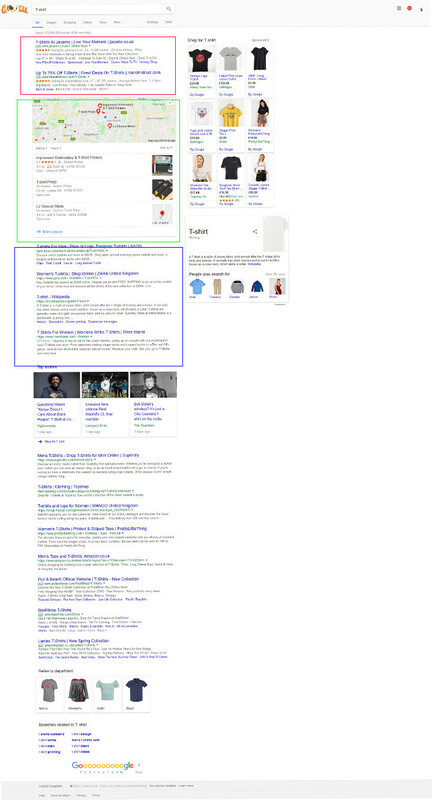 Because of that, Google thinks that these pages are the best pages to show when someone types in “T Shirt”. That reputation is worth hundreds of thousands of pounds and is used to dominate online sales for the likes of T Shirts. And that’s what you’d need to compete with a big retailer for generic keywords such as T Shirt. Well, it’s actually highly unlikely that a person looking for T Shirts is going to type T Shirt, your web address or your brand name into a search engine. In doing so the results page changes. 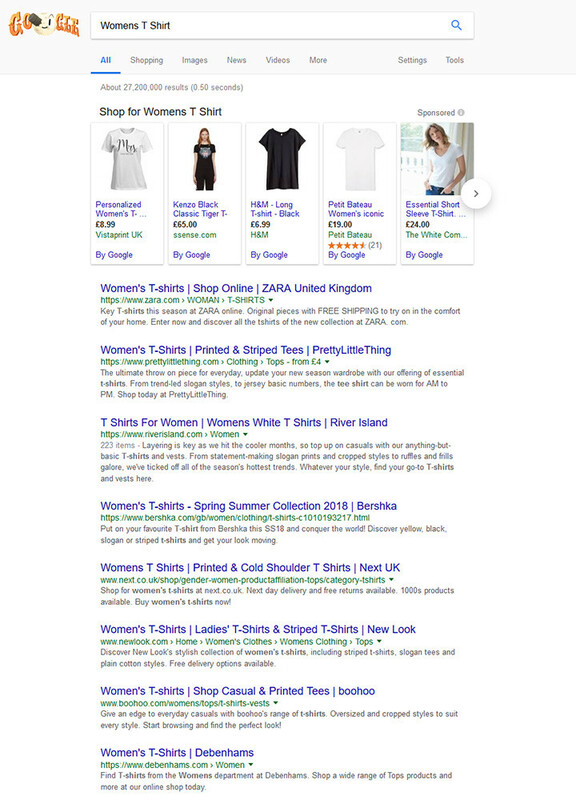 The pages that are now ranked and displayed, are pages which have optimised their content for the keyphrase “Womens T Shirt” as oppose to “T Shirt”. Now let’s get more specific and add a size. 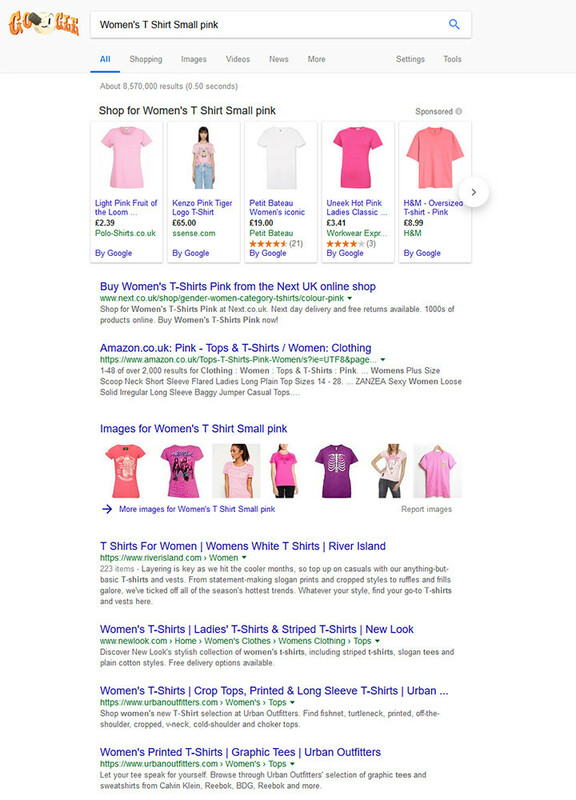 The results change again as these pages have used the keyphrase “Womens T Shirt Small” to target search engines and users. If we get even more specific we can use “Womens T Shirt Small Pink” and are shown the following different results. 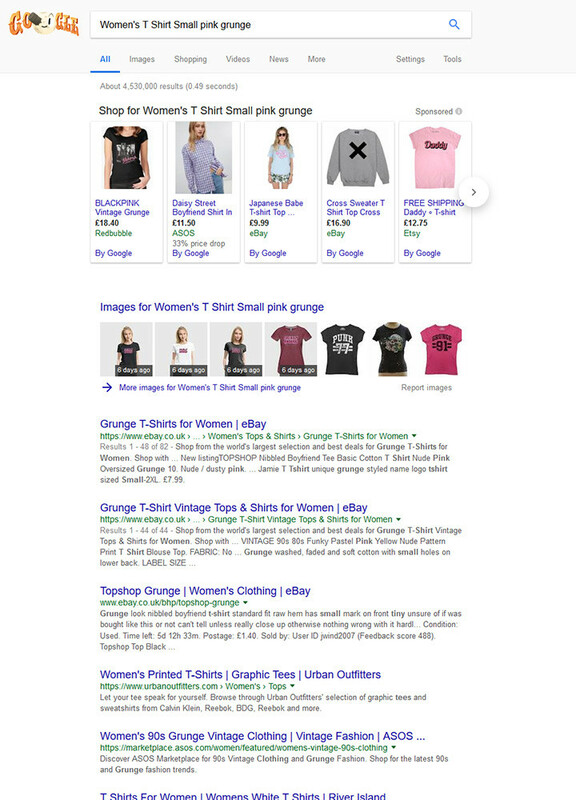 We’ve made our search pretty specific and more realistic with regards to someone looking for a Womans T Shirt, in Pink, in size small with a grunge style. In doing so we’re shown a totally different set of results then when we started. It’s also worth noting that the more specific and niche the keyphrase we used, the more we drifted away from big brand sellers. With each search, more niche online shops and small independent retailers were shown. The point is that most start-up online shops have no idea how search engines work and what affect they have on marketing an online shop. SEO plays a huge part of developing an online shop that can make sales. It affects everything from the way the site is built to the product descriptions on the page. It also highlights who’s your competition and how crowded your marketplace may be when selling anything. This in turn reflects how difficult it may be to make one single sale online and how much it may cost you to get that sale. The first search revealed the big online retailer Asos. The fifth search listed more predominantly, smaller online retailers and specialist brands. Researching SEO will show you a lot of hidden information about your position as an online retailer and how your shop should be marketed. If you’re a small online shop starting up, niche keywords and specific keyphrases (longtail) is where you’ll succeed with search engine rankings. It’s also a reflection on how sales are made online for a small start-up online shop. Online, you won’t be promoting your shop so people will buy your products, you’ll be promoting your products to get people to buy from your shop. You can do SEO yourself but you have to be quite internet savvy, technology savvy, analytical, mathematical and creative. In any case, don’t make the mistake of starting an online shop without looking at least a little into SEO, how much it costs and how it will affect your online shop. You may think that getting to the top of google must be quick, cheap and easy. The above process of SEO needs to be done organically. That means you need to put the work in, sow your seeds and wait for results. Results however can take a really long time to come, depending on the job and the end goal. Whats more it takes time, knowlegde and investment to get results from SEO. However, there is a quicker alternative. As an online shop you could use Pay Per Click (PPC) advertising. Google uses SEO to rank pages within its search engine naturally, based on the state, information and marketing that you set for your website. But you can use PPC to bid for a top position in the search engine results for any given keyword. Google will only charge you once the user clicks on your advert. And the cost of the click can vary depending on the popularity of the keyword. Generic keywords such as T Shirt will cost more because big retailers bid on these words. However generic keywords are unlikely to yield any sales for you because the term is too generic. For example, someone who types in T Shirt may not want to buy a T Shirt but may be looking for T Shirt images, how to make a T shirt or even how to spell it correctly. Keywords like “Womens Pink T Shirt” will also be competetive as its a popular key phrase with relevance. However, the keyphrase “Womens Small Grunge T Shirt Pink” will be less competitive, cheaper to bid on and more likely to generate a sale (if what you’re selling is a Womens Pink T Shirt in a Grungy style). As a start-up online shop, don’t make the mistake of not researching or using PPC. It can create a quick start to marketing your business and generating sales online. It’ll also help you to develop your websites SERP (Search Engine Ranking Position) a little quicker. From experience, I’ve found that online shop owners are business people and sometimes they just want to do business. They want to promote their shop and make sales but they don’t really want to get social, especially on social media. They see social media as a platform for a new generation of users who are sharing anything and everything on there. They share photos of food, conversations, what they did last night, what movie their watching and where they are at any given moment. For many online shop owners, they actually see this as an invasion of their own privacy. They don’t want to share their life, they just want to do business. Many new start-up online shops are actually not that familiar with social media and what it really is. A social media platform is like a traditional marketplace. It has market stalls (business users) and shoppers (individual social media users). However like a real market, consumers are not there just to shop. They’re there to socialise, browse, stop for a chat, have a cup of tea and talk about what’s happening in the market as well as their lives. The point is, to market your business, you need to be in the marketplace with a stall. That’s right. Some people do share photos of their food or where they are at any given moment. It’s fun for them to do so. Think of it as a personal PR hub to share expereinces within your online shop. When you start sharing you may find that people are actually interested in what you have to say. In turn they’ll like you, befriend you and essentially become a follower of your online shop. 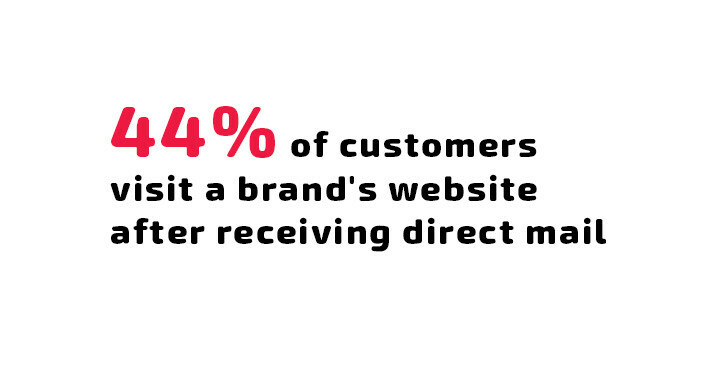 This means you have one person who’s actually interested and cares about your online shop and what it sells. Social media is a place for both businesses and individuals to promote themselves. An individual may promote a photo of the food they’re eating. Is it to show off that they’re in a fancy restaurant? Or is it to show off how good of a cook they are? Is it to show that they are socially active? Or is to show that they are trendy and only eat certain foods? Or it could just be that they’re happy to share their great experience! In any case, they’re promoting something. And as a business owner you can do exactly the same thing. Promote your online shop on social media. The great thing about social media is that you can do all of the above twenty times a day from anywhere with an internet connection. Whether a platform is popular for business or not is irrelevant. All social media platforms, once popular, attract businesses like moths to a flame. And different businesses can do well on different platforms based on industry and how the platform is used. But what we can see from the above is that photo social media networks (Instagram & Pinterest) are more popular with females than males. 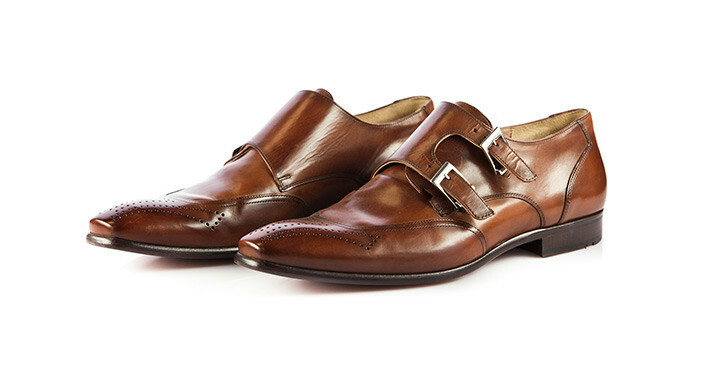 This makes them highly popular for fashion-based businesses. But Twitter and Pinterest have a wider age demographic with a good degree of more mature users still active on the site beyond 50 years of age. These two social media networks are also older than Instagram. Yet Instagram has the most active users. Based on what you’re selling within your online shop, you could pick out one platform, say Pinterest, to be a better option for social media marketing if you’re selling arts and crafts. The moral though is not to dismiss social media. As an online business research different social media platforms and pick one if not all of them to start advertising on. To learn more about twitter, check out my article Social Media for Introverts. 11. Not Marketing your online business offline in your local area. I’ve been banging on about online marketing but a common mistake made by new online shops is not doing any offline marketing. And the first and best place to start offline marketing will be in your local area. Sure, the internet means you can sell worldwide but it takes a lot of work to get your online shop found by anyone, let alone by users across the world. There’s also the point that people tend to buy from local and national retailers more so than international retailers due to shipping fees, returns, quality and the distrust of online retailers abroad. An address that’s domestic in some way. The closer the online shop is to a user, the more chance a user will buy from the online shop as it reduces risk of anything going wrong. For a better chance of start-up success, start marketing your online shop offline in your local area. It will help to start sales coming in and have a good effect on your SEO and online marketing as well. I’ve met plenty of new, start-up shop owners who wanted to open a business but they didn’t want anyone personal to them to know they were in business as an online shop. There’s nothing malicious or illegal about it. It’s a case of not mixing business with pleasure. This though, is a common mistake. As an online shop owner, you need to leverage what connections you already have to spread the word about your shop as quickly and cost effectively as possible. To do so, use friends, family and existing connections and social media profiles to start promoting your shop in any way that you can. Don’t keep your shop a secret in any way, to anyone. It’s essential that as many people as possible know about your online shop. You’ll be amazed at how much quicker the word spreads about your shop and how easily sales can start to come in, just from using your social contacts. Don’t make the mistake of not leveraging your existing contacts. Some of the smallest, new start-up online shops became successes becasue they leveraged theri freinds and family as sales people. I bet you’ve heard of it. And if you’re not an avid blogger then you probably don’t really know what is is or how it works. But as an online shop owner, you should do. A blog is like an online journal allowing you to post new content onto your website as often as you like. It keeps your site fresh with new information that’s based on a specific subject ie. whatever it is you’re selling. It also happens to be a great way of climbing up those search engine rankings. What’s more, as long as you can write, it’s something you can do yourself. As an online shop you need a blog and you have to start writing about your products. Add features, reviews and comparisons. Create creative content based on your products and industry. And turn your blog into your very own PR hub and share every post you create via social media and email newsletters. A blog is an extremely powerful marketing tool. Don’t make the mistake of not using it. 14. Trying to be a perfectionist (all the time). The online world is a fast paced changing environment. And to make a success of your online shop you need to match that pace. If you move too slow you could spend months setting up the perfect store, preparing for the ultimate launch or trying to get an email campaign just right. The sad thing is that it’ll be time wasted. Because nothing is ever perfect. And the truth is that none of it will matter. The lifespan of digital assets is pretty short so by the time you’ve taken to perfect something, the internet would have moved on. By no means should you produce quick shoddy results. Take your time perfecting things which are worth it but don’t waste time getting small details perfect because small details will always change. It can be a real killer of success. There are many rags to riches stories of online shops but in all honesty, they never give you the full story. They tend to glamorise the struggle of success but hide integral details like the marketing, personal support and technical support that most successes did have. On the flipside, there’s nothing to stop you from opening an online shop with a £100.00 budget and no knowledge of marketing at all. If anything, the three common traits that any business needs to be a success is perseverance, support and a bit of luck. But by reading the above tips you at least know what you’ll need to do at some point or another when opening an online shop. If you want to avoid the pitfalls of building an e-commerce site or an online shop then get in touch for an informal chat. We’d be happy to advise, build a brand and an online shop just for you.